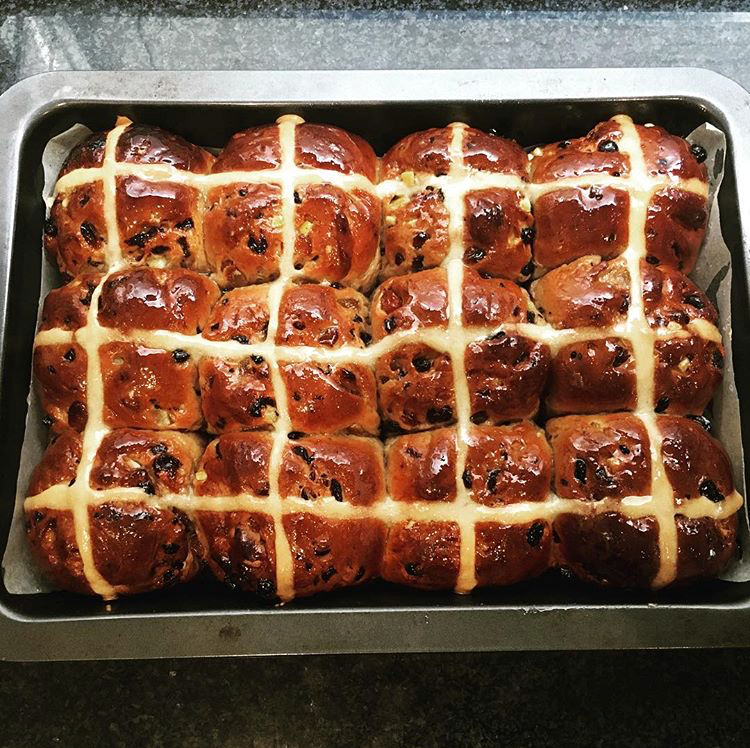 A couple of days ago I said to Emma that we must get some Hot Cross Buns for the weekend. Her reply was that she would make some, using a recipe that she has used for the last couple of years. So if you’re feeling energetic and have some spare time over the weekend here’s her recipe. Place the yeast, 2 tsp of sugar and the milk in a large bowl and set aside for 5 minutes to let it foam. Add the flour, spices, butter, egg, fruit and remaining sugar to the yeast mixture and mix until a sticky dough forms. Knead the dough on a floured surface for 8 minutes or until smooth and elastic. Place in a lightly oiled bowl, cover with a clean, damp cloth and put aside in a warm place for about and hour, until doubled in size. Divide the dough into 12 pieces and roll into balls arrange balls in a lightly greased square or rectangular cake tin. Cover with a cloth and set aside to rise for 30 minutes. Preheat the oven to 200C. Place the extra flour and water in a bowl and stir to combine. Place in a ziplock bag with the corner snipped of and pipe crosses on the buns. Bake for about 30 minutes until springy to the touch. Make the glaze while the buns are baking. Place the water in a small bowl and sprinkle over the gelatine – set aside for a minute until the gelatine has absorbed. Place the sugar and extra water in a pot and stir over a low heat until the sugar is dissolved. Use a wet pastry brush to remove any sugar crystals that form around the edge. Add the gelatine mixture and cook for a couple of minutes until the gelatine has dissolved. When the buns are done brush the warm glaze over them while they are still hot. Serve warm with plenty of butter.